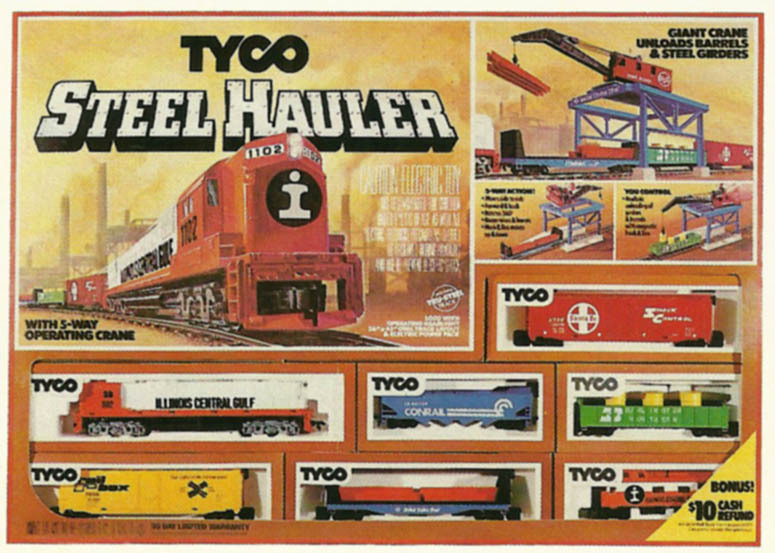 A new release featured in TYCO’s 1981 catalog was the Steel Hauler train set. This offering was promoted on television by TYCO and featured the manufacturer’s Alco Super 630 and an overhead crane accessory. Headed up by an orange-and-white Illinois Central Gulf (ICG) Alco Super 630, this early 1980s train set provided a very good example of a well-appointed TYCO train set. This set included two 50-foot plug-door boxcars (Railbox and Santa Fe), a 40-foot Conrail hopper car, 40-foot Burlington Northern gondola, and 50-foot Conrail bulkhead flatcar, and TYCO’s signature streamline-cupola caboose decorated in orange-and-white and lettering for Illinois Central Gulf. The set included an oval of TYCO’s Tru-Steel track that built a 36 x 45 inch track plan and a power pack. Additional items included the loads for the gondola and the bulkhead flatcar. The gondola load was three yellow magnetic barrels and a pair of stacked orange magnetic I-beams. The big feature was the introduction of TYCO’s Giant Crane that debuted with this offering in 1981. TYCO lists its Alco Super 630 with three road names in the 1982 catalog: Delaware & Hudson, Illinois Central Gulf, and Santa Fe. The ICG model was the later version of TYCO’s offering for this diesel model. A focal point for this 1981 TYCO train set was its Giant Crane accessory. This interesting action accessory was made of a combination of existing and new tooling items in TYCO’s collection. The blue plastic superstructure and gray plastic base come from TYCO’s Piggyback Loader/Unloader (No. 903) and the red-and-black crane come from the manufacturer’s Crane Car with Boom Tender. 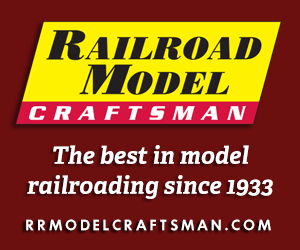 The blue-and-black Conrail bulkhead flatcar is TYCO’s late 1960s Pulpwood Car (No. 334A) without the plastic log load. New for this offering, the orange I-beams were created for this release. The yellow barrels in the green Burlington Northern 40-foot gondola were new items in 1981. The base the red crane resides on is new for this release, as is the magnetic hook on the end of the crane. 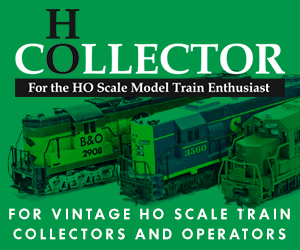 Though TYCO only cataloged its Steel Hauler train set in 1981, the Giant Crane (No. 950) continued in the company’s line for a number of years. You could purchase the Giant Crane as a separately sold action accessory and it also made appearances in TYCO’s Virginian (No. 7424) train set in 1982 and Casey Jones (No. 7408) set from 1983 to 1986. The Virginian Alco Century 430 was back in 1984 as power for TYCO’s Super Rail Master (No. 7426) train set and the Giant Crane was part of that release. 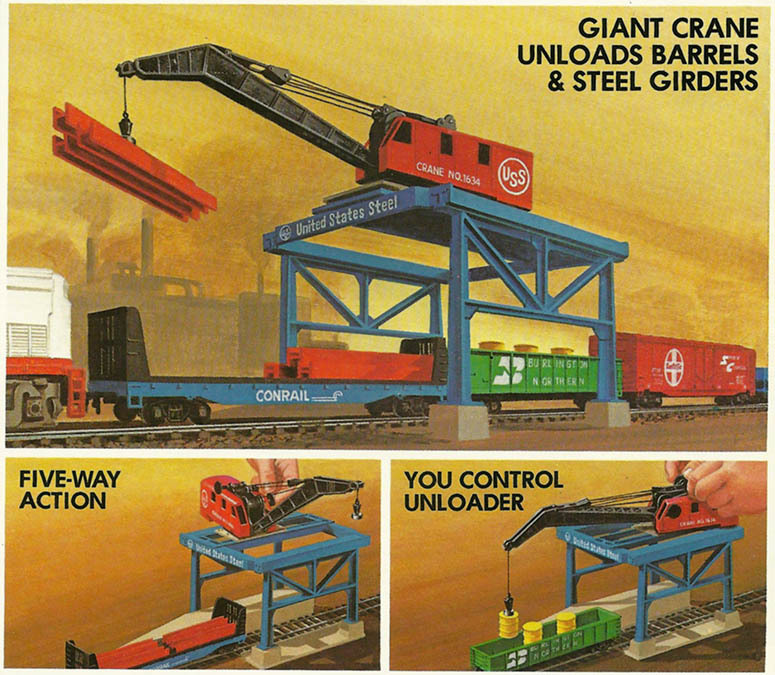 The Super Rail Master returned in 1985’s catalog with the same components, including the Giant Crane. No train sets included TYCO’s Giant Crane as of the 1987 catalog, though the item remained in the catalog as a separate action accessory offering through the 1992 listing.